ChallengeWave exhibited at the largest Human Resource Manager conference in the world. Attendance at SHRM 2012 was over 13,000 attendees. We were delighted to have many world class speakers like Condoleeza Rice, Malcolm Gladwell, Jim Collins and Tom Brokaw speaking at the conference. 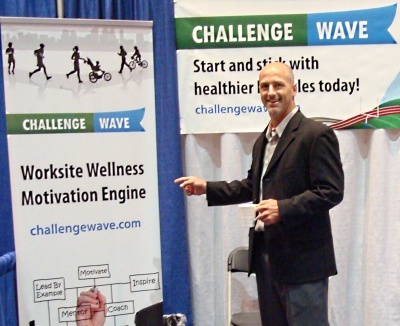 ChallengeWave was on the exhibitor floor talking with attendees about how to get more wellness participation and healthier employees. "Greatness is not primarily a function of circumstance, greatness is first and foremost a matter of conscious choice and discipline" - Jim Collins author of Good to Great. ChallengeWave is pleased to be a finalist in the BCBSNC Health Innovation Challenge. The Health Innovation Challenge invited North Carolina's entrepreneurs, community leaders, citizens and university students to submit innovative solutions to help reduce obesity across the state and increase the competitiveness of the North Carolina economy. It's an honor to be evaluated and selected as a finalist. We recognize the hard work and innovative ideas of our fellow competitors and we wish them the best of luck in the final round. "Through the Challenge, BCBSNC, Bull City Forward and the Institute for Emerging Issues provided a great opportunity for entrepreneurs across the state to share and bring their innovative ideas to the table, ideas that we are confident will impact change across the entire state of North Carolina." - Anita Brown-Graham, Institute for Emerging Issues director. ChallengeWave finished a 6 month program with faculty and staff of Chatham County Schools. The voluntary participation rate reached 40% and demonstrates the long term effectiveness of ChallengeWave as an employee wellness service. ChallengeWave sponsors the NCSHRM 2011 conference in Raleigh, NC. The NCSHRM 2011 conference put us in front of 500 HR Professionals in the state of North Carolina. We talked to many about starting and enhancing their wellness programs. Our team in the NC SHRM Golf Tournament took second place with a score of 49! ChallengeWave sponsors the NC Association of Health Underwriters 2011 Symposium in Winston-Salem, NC. The NCANU 2011 is the largest gathering of Health Underwriters in North Carolina. We spoke with many brokers interested in offering a low cost, highly effective wellness program to their clients with the overall goal of lower renewal rates. ChallengeWave was selected as 1 of 11 innovations to highlight at the 2011 Institite for Emerging Issues Forum. The Institute for Emerging Issues (IEI) at North Carolina State University is a public policy "think-and-do" tank concerned about the future of North Carolina. 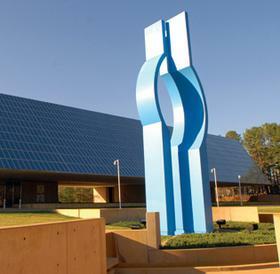 IEI employs a unique public policy process to convene leaders from business, nonprofit organizations, government and higher education to discuss and develop action steps to combat the challenges to North Carolina's future prosperity. The 2011 Forum focused as a summit on healthcare innovations in North Carolina. The IEI highlighted the state's most promising ideas, many of which are now hidden behind walls of their creative institutions. We were part of a panel to discuss how technology could help bend the undesirable health curve in North Carolina. Some of the speakers include: Governor Perdue, Sanjay Gupta, CNN Health Reporter, Indra Nooyi, CEO of PepsiCo, Clayton Christensen and Dr. James Gavin, Chairman of the Partnership for a Healthier America. Video about our very own Dan Wilson asking Sanjay Gupta "What's the number one low cost thing we can do to improve the health of Americans?" at the Institute for Emerging Issues Forum - 2011. Video about the Institute for Emerging Issues Forum - 2011. Read more about ChallengeWave on our About Us page.